We literally cannot stop watching this video! Had us both in tears, such an emotional, incredible day! We love every single picture, you really have done an amazing job! I was so chuffed when Hayley and Nathan came to me about their Royal Duchy Hotel Wedding photography. As some of you may or may not know Tamsyn and I used to own a photo minilab franchise in Truro a decade ago and Hayley's dad Richard was one of our regular customers. Most weeks he or Hayley's mum Alison would bring work in as Hayley's dad worked as a professional photographer too and would get his photos printed with us. So when I received the enquiry through my website I immediately recognised Hayley's surname and was delighted to photograph their wedding. It really was catching up with old friends. My wife Tamsyn was booked for another wedding to do the makeup so I had the help of the lovely Gail to second shoot on this right royal road trip. Our day started with meeting Nathan in Redruth where he was getting into his Ted Baker suit with the boys. I always love getting to meet all the key players early on in the day so I can set the tone and their minds at rest that it's going to be a playful and fun day, getting story telling shots but also some interactive playful ones too. And with Ben one of their ushers being the captain of the Royal Navy rugby team I knew it was going the be spirited. Before I knew it, it was time to leave Gail with the boys to travel to Stithians church via the Seven Stars pub, while I headed to the girls getting ready at Richard and Alison's in Truro. On arrival I found the the lovely makeup artist Sally Orchard working on Hayley's makeup. So while she was finishing off I got some detail shots of Hayley's dress she bought from Bliss Bridal in Perranporth along with her other bits and pieces. We were greeted on arrival to the church by lots of happy little faces, as Hayley works at Cubert school and the school choir were there to entertain the congregation while Hayley and Nathan were signing the register. Bless them, when the kiddies saw Hayley getting out of the car it was like the scene of a princess Dianna visit with all these little beaming faces waving at her. After the ceremony we shot the group photos at the church before continuing our journey on to leg four, taking us to Nathan's nan's as she was not well enough to attend the ceremony and Nathan understandably wanted to get a photo with the lady who inspired them to get married in that particular church. 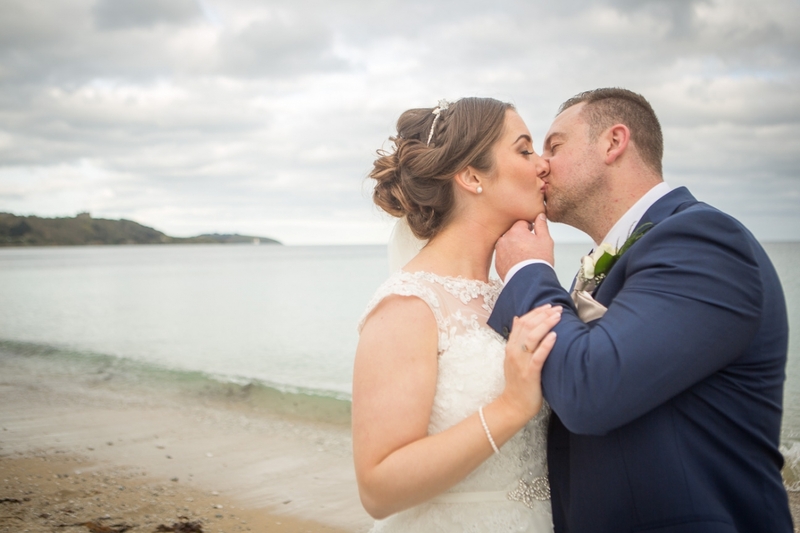 So after a very quick stop we continued on with leg five taking us to the beautiful Royal Duchy Hotel on the seafront in Falmouth where Hayley, Nathan and their guests had their wedding breakfast within the gorgeous restaurant. But not until after some rather emotional speeches. For leg six we journeyed on to Gyllyngvase beach in a King Harry Coach with the bridal party for some playful photos on the sand. It was such a lovely evening and our laughing party certainly raised a smile or two on the faces of the people enjoying evening sun. Leg seven saw us leaving the bridal party for pickup from the coach while I took Hayley and Nathan off to a Falmouth Favourite of mine for some couple photos. On leg eight we headed to the Princess Pavillions via the gardens just outside for a photo where Nathan and Hayley captured the photo for their wedding invite. When we arrived at our final destination it was time for what was the best first dance I've seen in years. Well done guys, it was certainly worth doing all those classes for! Dearest Hayley and Nathan, thank you SO much for remembering me and asking me to photography your very special day, Gail and I thoroughly enjoyed every minute of it! Royal Duchy Hotel Wedding of Hayley and Nathan. Falmouth wedding, Cornwall wedding, Multi award winning wedding photography.